Trelewis’ Luke Osman (3-12-1, 1KO) has confirmed to BoxingWales.com that he has been forced to withdraw from his Welsh title eliminator with Swansea’s James Lilley (6-4, 1KO) but he’ll still fight on the same show. The middleweights were due to face off on Sanigar Events’ July 11th ‘Repeat Or Revenge’ show in a ten round contest to determine who would proceed to challenge Welsh champion Frankie Borg. However, Osman has struggled with training time and can’t go through with a ten round contest. Osman said, “I’ve struggled to fit in all the training I need for a title eliminator fight. It’s hard with a day job and I’m not ready for it yet, to be honest with you. I’d rather have more rounds first and then build up to it. “I work on a construction site in the day, that’s 40 hours a week. I run in the mornings, go to work, come home to change and I’m straight to the gym to train. It’s not easy!” Instead, Osman will face Cardiff’s Jimmy White (0-1) who trains at Jamie Arthur’s gym in Rhydyfelin. Despite the disappointment of dropping back to a four round fight, Osman is determined to keep his eye on the prize. He said, “I don’t know a lot about him, to be honest. I know his last fight was in 2002, that’s it but that’s nothing new for me. I usually try to see if there’s something of my opponent on YouTube but I’ve not been able to find anything about him. It doesn’t matter to me though, I still need to win to go where I want to.” “Preparation has still been good, this is probably the longest notice I’ve ever had for a fight and that’s been missing all through my career. Normally in the past, the most notice I’ve had is two or three weeks but this time, I’ve had six weeks. 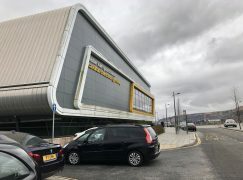 This is a good chance for me to show what I can do again.” The fight at the Merthyr Leisure Centre will be Osman’s first in Wales since a sixth round stoppage defeat to Borg in their British Masters title fight two years ago. Osman’s overall aim is to eventually gain revenge over Borg who has since gone on to capture the Welsh title with a storming win over a game Gary Cooper in BoxingWales‘ 2013 Fight of the Year and successfully defend it against former European champion Kerry Hope. 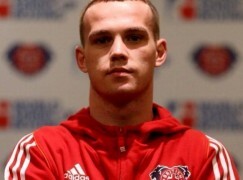 Osman said, “I’ve always wanted to win the Welsh title, that’s my career ambition. Before I finish boxing, I really want to be Welsh champion. Frankie is the champion and he’s got a win over me, so I’d love the chance for a rematch down the line. “Frankie’s improved a lot since we fought and he’s got good wins under his belt. He’s getting better and better, maybe he’ll fight for a British title soon but I’d really like to fight for the Welsh title against him.” In March, the 28-year-old southpaw registered his first win in four years with a points victory over debutant Liam Hunt in Bristol and he doesn’t want to wait that long before winning again. He concluded by saying, “The guy I boxed was having his first fight, I didn’t really know much about him but I managed to adapt and beat him on points. I was coming back from a break, I needed it but now I’m back. I want to build momentum now, get as many wins as I can and hopefully I won’t have to wait four years for my next win!” £30 and £50 tickets for ‘Repeat Or Revenge’ on July 11th at the Merthyr Leisure Centre are available from Sanigar Events and Bristol Boxing Club on 01179496699. For more information, visit: www.westcountryboxing.com. 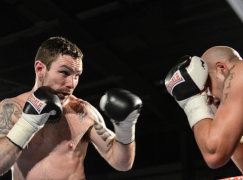 It will be headlined by Dai Davies (10-23-2, 1KO) and Robbie Turley’s (13-4, 3KO) Welsh featherweight title rematch. In support will be Frankie Borg (8-2, 3KO), Craig Kennedy (8-0, 5KO), Alex Hughes (1-0, 1KO), Adam Goldsmith (2-0-1) v Stuart Brewer (1-0), Tony Dixon (4-0, 1KO), Dorian Darch (7-3, 1KO), Lewis Patterson (3-2, 1KO), debutants Kyle Jones and Ricky Rowlands.